Students march to Legislature as part of national day of action. Photo by Levi Garber. Hundreds of students marched from the University of Winnipeg to the steps of the Manitoba legislature Nov. 2 in a demonstration calling for free post-secondary education across Canada and higher rates of provincial funding for education. 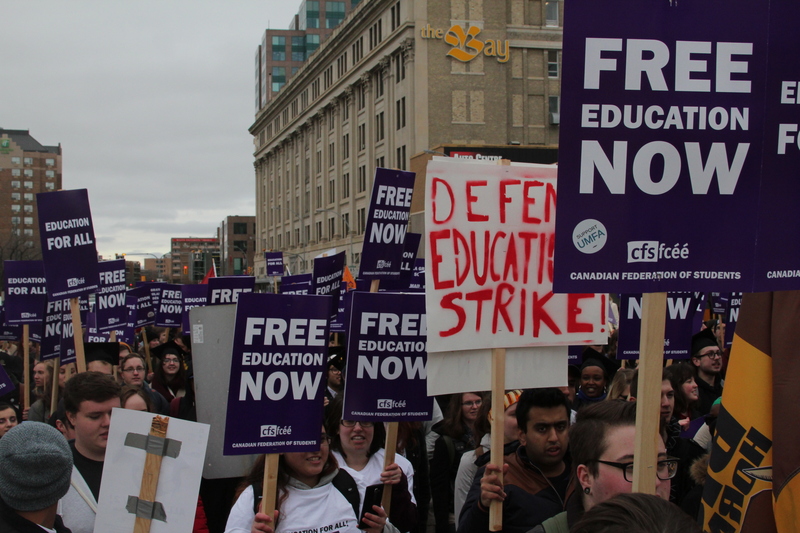 The National Day of Action, hosted by the Canadian Federation of Students-Manitoba (CFS-MB) in Winnipeg, took place across 30 Canadian cities through coordination by the Canadian Federation of Students (CFS). Students from the U of M, U of W, Brandon University and Université de Saint Boniface participated in the Winnipeg demonstration and were joined by members of labour unions such as the Canadian Union of Public Employees, the Manitoba Government and General Employees’ Union, Unifor, and the University of Manitoba Faculty Association (UMFA), among others. Michael Barkman, chairperson of CFS-MB, kicked off the event on the quad of the U of W with a speech welcoming attendees and thanking labour union representatives for their show of support. 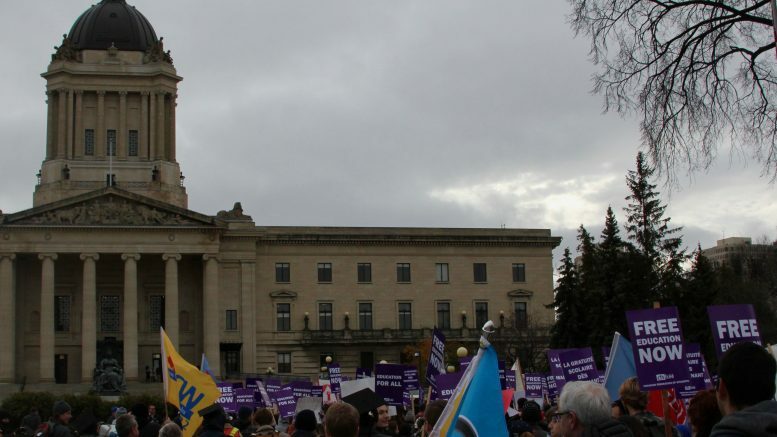 Following a short march from the U of W to the steps of the Legislature, students from both the U of W and U of M, and UMFA president Mark Hudson gave speeches to those who participated. Barkman then invited attending students to join him and other CFS-MB executives to sit in on that day’s question period, where tuition and the state of Manitoba’s education system were discussed. U of M criminology student Elizabeth McMechan said she supports the call for free post-secondary because the current framework creates financial barriers for some potential students. “I think that right now, university education is not accessible for everyone because our priorities are mistaken,” she said, adding that the provincial and federal governments should be more concerned with making education available to everyone by reallocating funding into post-secondary programming. Some students in attendance expressed the belief that making post-secondary education completely free may not be realistic with the current Progressive Conservative government, but said they will fight to keep it affordable. 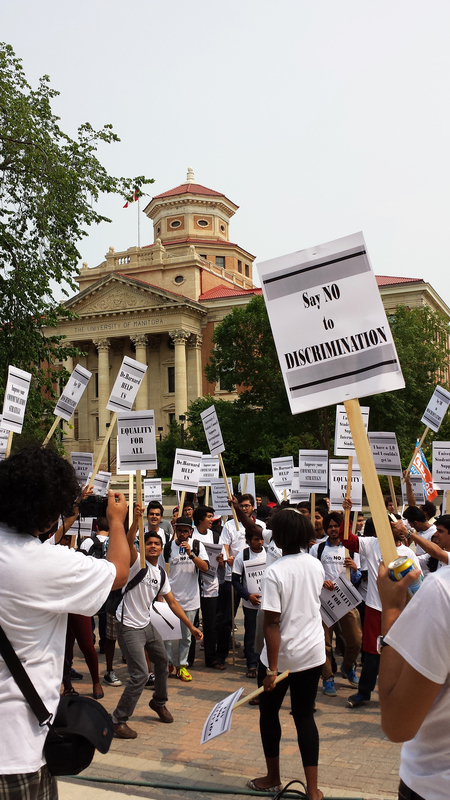 University of Winnipeg Students’ Association vice-president external Sadie-Phoenix Lavoie said during the demonstration that post-secondary education must be more accessible to students from low-income backgrounds. Students march as part of national day of action demonstration. Photo by Levi Garber. Barkman spoke to the media following the demonstration and explained that although tuition is generally affordable right now in Manitoba, things may change soon. “Right now, this government has threatened to eliminate the legislation that protects tuition fees to be [only be] increased at the rate of inflation,” Barkman said. Provincial finance minister Cameron Friesen said those worries were misguided. “I think that there is a lot of fear-mongering that is taking place out there today and we certainly would not want to add to those fears,” Friesen said after question period at the Legislature Wednesday. “We understand that affordability matters to students and Manitobans,” he said. In 1999, the provincial NDP government implemented a tuition freeze. That freeze was lifted in 2009, and eventually, in 2012, the provincial government passed legislation mandating tuition increases be held to the rate of inflation. MLA for St. Boniface Greg Selinger served as premier in 2012 when the provincial government passed the tuition cap. On Wednesday, he marched with the protesting students to the Legislature. “We have legislation in place that keeps [tuition] no higher than the cost of inflation; we think it should stay that way,” he said. Fort Rouge MLA and NDP education critic Wab Kinew also attended the demonstration, citing his belief that education “is a right” and must remain affordable. “If they raise tuition, I think that would be a mistake because tuition kept at an affordable rate is a policy that would benefit every student,” he said. 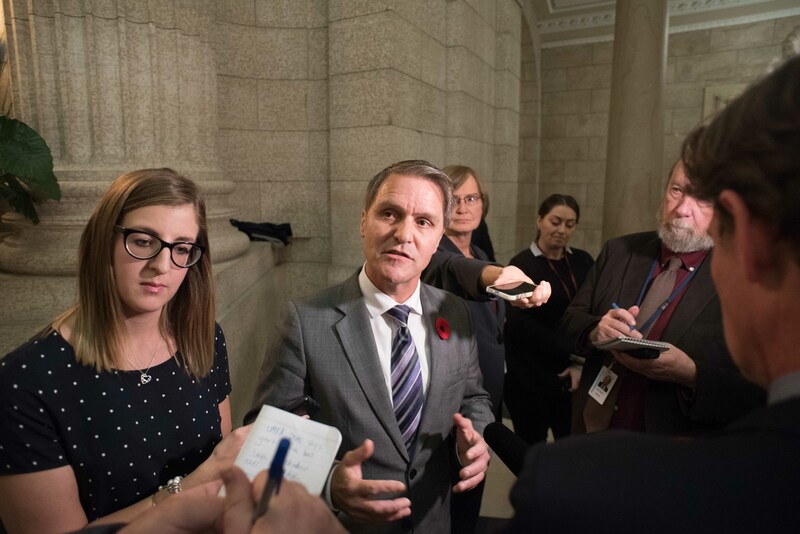 Speaking to reporters following question period Thursday, Premier Brian Pallister said he sympathized with students who have trouble affording post-secondary education. Since being elected, the PC government has hinted it will raise tuition fees in its next budget. The ongoing faculty strike at the U of M galvanized many taking part in the demonstration who believed the students there and the faculty on the picket lines have shared goals for post-secondary in Manitoba. In his speech at the legislature, Hudson lauded the students who stood in solidarity with UMFA and joined the ongoing pickets set up at the U of M Tuesday, saying their aim for quality post-secondary education was a shared one. Jakob Sanderson, a third year political studies student at the U of M, said he supports the strike.